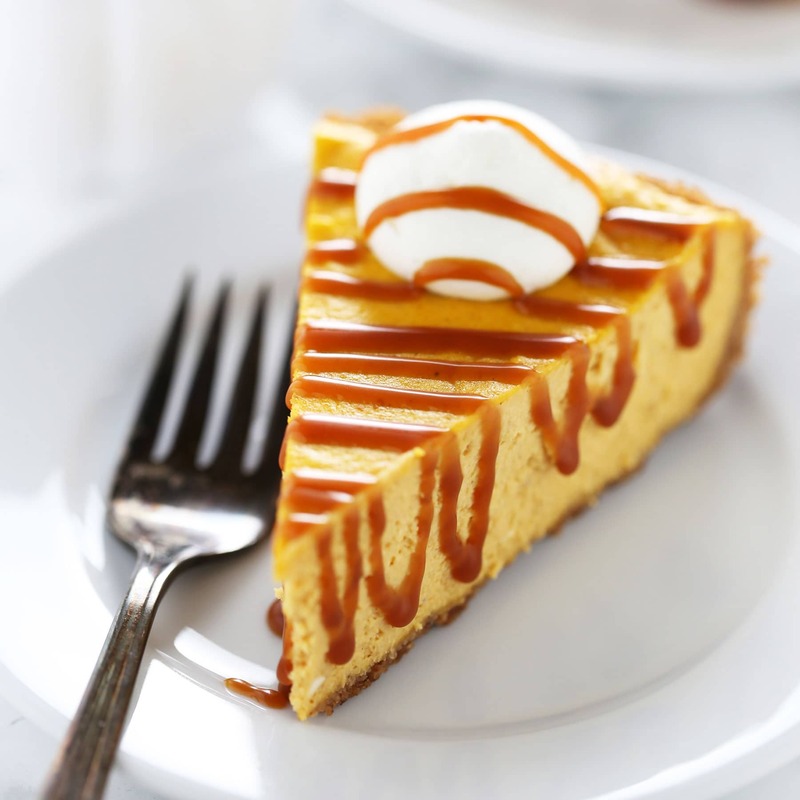 Salted Caramel Pumpkin Cheesecake is the ultimate crowd-pleasing and fun Thanksgiving dessert! SO much more flavorful than pumpkin pie! Taste: Like fall perfection! Much more flavorful than pumpkin pie. Texture: The crust crunchy buttery crust is the perfect contrast to the ultra thick, rich, and luscious cheesecake filling. Ease: Totally doable, just requires some patience while you wait for the cheesecake to chill. 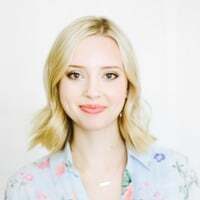 I’m bursting with excitement to finally share this post with you! Why? Well because this recipe for Salted Caramel Pumpkin Cheesecake kicks off our 1st annual Holiday Baking Bonanza!! 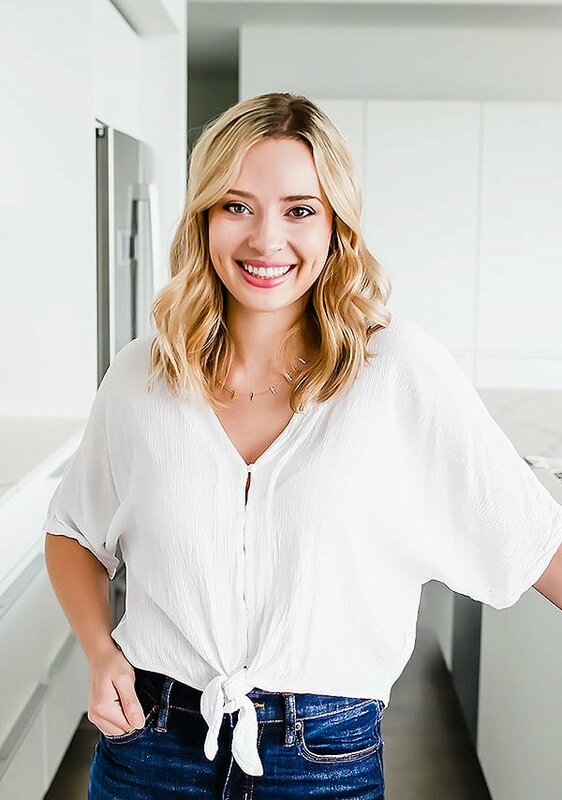 I’m co-hosting this series with Ashley from Baker by Nature and we’ll be sharing our best holiday recipes, tips, tricks, resources, giveaways, and more (fo’ free)! We have SO much in store for you. 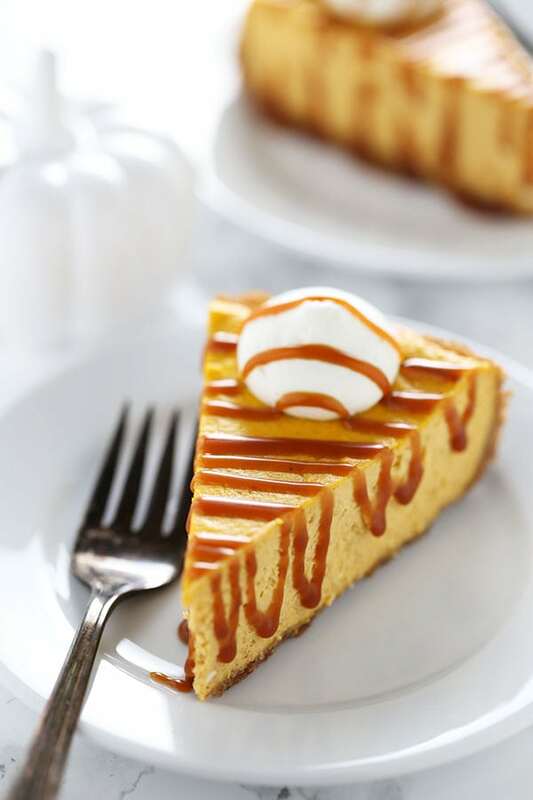 I hope you’ll follow along in this series with us, and I also hope you’ll make this recipe for Salted Caramel Pumpkin Cheesecake asap because it’s so darn good. In my family we’ll take this cheesecake over pumpkin pie ANY day. It’s always a hit! For this recipe, feel free to follow my tutorial here for how to make homemade caramel sauce. If you want to make things quicker and easier, you can totally use store-bought salted caramel sauce. My favorite is the one from Trader Joe’s! Prepping the cheesecake takes no time at all since the food processor does all the hard work. It does need an hour in the oven to bake, and 6 hours to chill after that so be sure to give yourself plenty of time. The best part about serving cheesecake during the holiday season is that it basically has to be made ahead of time, and will stay good in the fridge for up to 3 days. 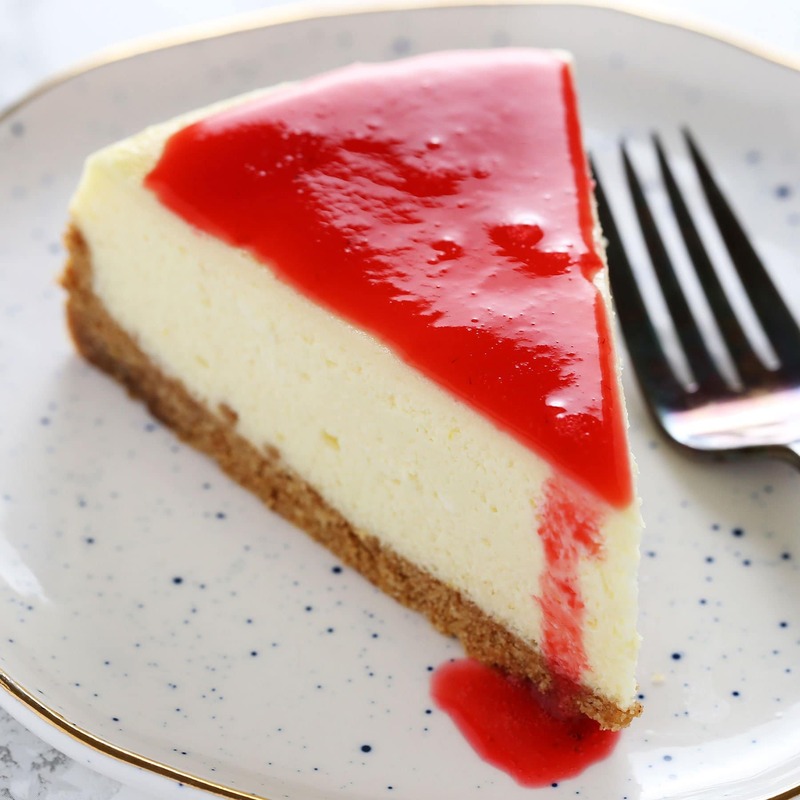 A trick to avoiding cheesecake cracks is to allow the cheesecake to cool in the oven with the heat turned off for 10 minutes before removing it. Then, let it cool completely to room temperature before refrigerating it. You basically want to be really gentle with temperature changes when it comes to cheesecake. The good news, however, is that even if you do get some cracks we’re just going to pour caramel over the cheesecake so no one will really notice. 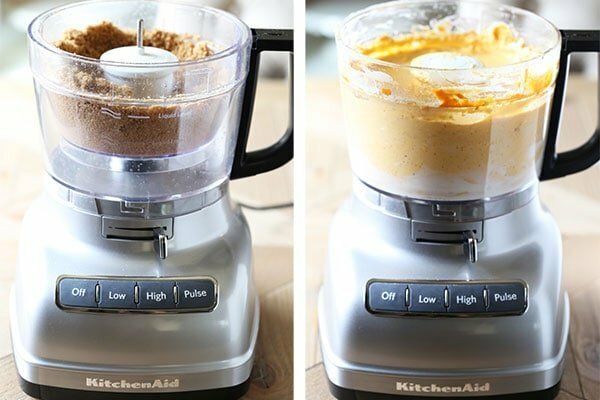 In the bowl of a food processor, combine the graham crackers and cinnamon. Pulse until finely ground. You should have 1 3/4 cups (230 grams) graham cracker crumbs. Add the butter and pulse until moistened. Press into the bottom and halfway up the sides of the pan. Bake for 10 minutes. Place on a wire rack to cool. Maintain oven at 325°F. In the bowl of a food processor or electric mixer, beat the cream cheese, sugar, pumpkin puree, caramel, and sour cream until smooth. Add the eggs and yolk, cinnamon, nutmeg, cloves, flour, and vanilla and puree until just combined. Pour over crust and spread evenly. Bake for 1 hour, or until set and dry at the edges but slightly jiggly in the center. Turn off the oven and allow to cool inside for 15 minutes before removing to a cooling rack to cool to room temperature (this helps prevent cracks). Refrigerate for at least 6 hours, or overnight. The cheesecake can be refrigerated for up to 3 days. Top with whipped cream and caramel sauce before serving. 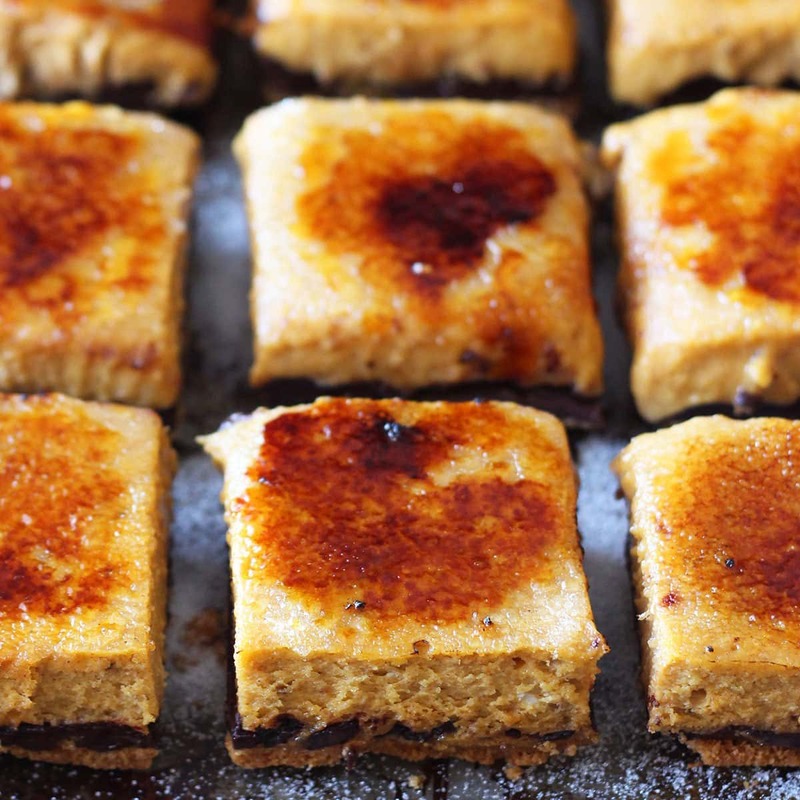 For a fun twist, feel free to use Speculoos or Gingersnap cookies in place of the graham crackers! You'll need 1 3/4 cups (230 grams) of crumbs. This looks so so yummy. Oh how I love pumpkin everything and salted caramel. mmm mmm mmm! This cheesecake looks great! I think I will make it soon, maybe for Thanksgiving! Entry into Kitchenaid Sweepstakes. Thank you! I can’t find where to enter for the giveaway, did I miss it? Salted Caramel AND cheesecake! Yum! Love the giveaway…cheesecake looks yummy! I love to bake cheesecake and actually leave mine in the oven for an hour so that the top doesn’t crack. I never thought to put salted caramel on top but can’t wait to try it – those pics are just making me drool. I can’t find where to enter the giveaway either??? Awesome giveaway for the Kitchenaid Food Processor – but how do you enter? I couldn’t find any information beyond the instructions to “Enter Below”? This looks delicious! I may be missing something but I see that salted caramel is listen in the ingredients for the filling but not in the instructions part. Is it used in the filling as well as the topping? Thanks! I would love to have a Kitchenaid Food Processor; I sure could use one. What a great giveaway. I mince up raisins for cookies, cakes. This sure looks yummy. Perfect for Thanksgiving. How do I enter the giveaway for the Kitchen Aid Food Processor? I didn’t see anything in the post about how to enter. 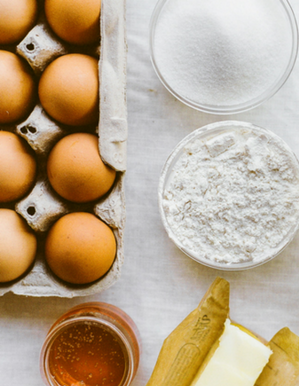 Looking forward to baking and learning from your recipes and tips. Love cheesecake. I can’t find the link for the KitchenAid give away 🙁 This recipe looks soooo good!! I know my granddaughter will love it!! Thank you for sharing it!! I love salted caramel and am excited to give this pumpkin recipe a try for the holidays. Not sure if leaving a comment is what qualifies as an entry for the giveaway…but I LOVE my food processor! Yummy! Just the name “salted caramel…” makes my mouth water!!!! Would love to win the Kitchen Aid food processor! Can’t wait to make the salted caramel pumpkin cheesecake. YUM! I love pumpkin anything and can’t wait to try this! This is sure to be a crowd pleaser at Thanksgiving! 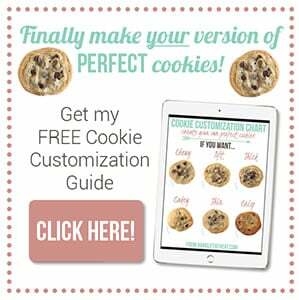 Will definitely have to try this recipe – please consider me entered for the food processor giveaway!!!! I made your NY style cheesecake the other week and it was amazing! I’m looking forward to trying this recipe next. Any reason this cheesecake doesn’t keep for more than 3 days? I thought most cheesecakes were good in the fridge for much longer! 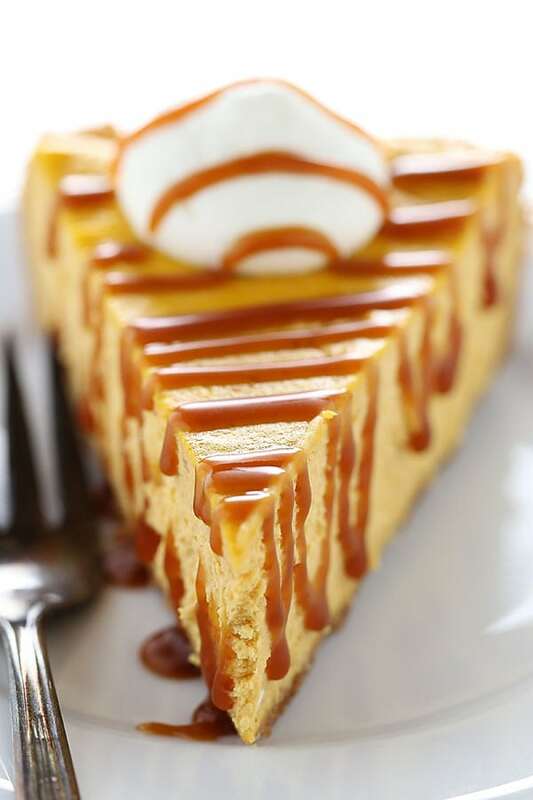 I wish my family liked pumpkin and cheesecake more, as this looks divine! I may have to make it anyway to convert them….I’d definitely use ginger snaps in the crust; I’ve done that with other recipes and it added a wonderful “zing.” My old Cuisinart food processor is on its last legs, so it would be great to replace it with this new one. Yummy! I LOVE pumpkin AND cheesecake so putting them together will be amazing! 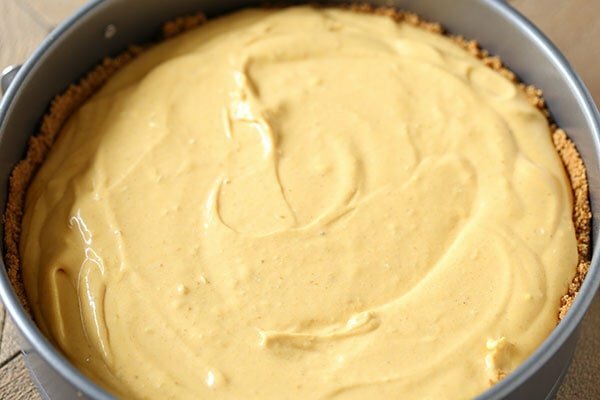 I had a homemade Pumpkin Cheesecake several years ago and have been wondering how to find/make one… Thanks for the recipe and the giveaway! This looks delicious ! Must give it a try soon!! I relish pumpkin cheesecake. Adding a salted caramel sauce sounds divine. A must try! You list sour cream as part of the filling but not how much sour cream. I’m planning to make this for Thanksgiving sounds amazing! How much sour cream? Making for thanksgiving. I’m a bit confused on how much sour cream this recipe calls for. Is it 1/4 cup? Thanks! I am beyond excited looking at this recipe for our Thanksgiving Holiday in a few days! I will be making the crust with Speculoos cookies, LOVE TRADER JOES!!! so beyond excited to see my family and to bring this desert will be one of the many joys. Thank you! I’ll let you know how it goes over. Hope your family loves it! Getting ready to make this for tomorrow. Can I use store bought Graham cracker crust that is already in a foil pan? Hi Alissa, that won’t quite work for cheesecake. It needs to be baked in a springform pan, which has more capacity and a removable bottom. Just made this. So far so good, although I think I didn’t wait long enough for the cream cheese to get to room temperature, so there are a few flecks of cream cheese that didn’t mix in so well, even after baking. I used half graham crackers and half ginger snaps for the crust, so we’ll see this evening how delicious this is! Happy Thanksgiving, everyone, and thanks for the recipe! Well, its out of the oven and looking good. The homemade caramel sauce is amazing. Im hoping it will look as pretty as yours tonight! Thanks for the recipe. I made this for Thanksgiving and it was perfect- great job on the detailed instructions, photos and video! Sooo much better than traditional pumpkin pie. Loved the caramel sauce too. I originally mixed the cheesecake filling with a mixer (my food processor was too small) and also got the tiny lumps. However, I then mixed it in batches in the food processor and it smoothed it out. Loved it- thank you! If I use 2 cake pans instead of this pan you recommend how would that affect baking time? So good! But, there is an error in the directions. It tells you to put the caramel in the cheesecake. Then it tells you to drizzle. Do Not put the caramel in the cheesecake!! I made this for family and friends in the Netherlands where using pumpkin in desserts is not so common. They all loved it and were very surprised with the delicate taste! It’s really worth it to make your own Caramel, the tutorial makes it easy. The cheesecake is really big so small slices are perfect. Thank you for this awesome recopen. Baked this cheesecake this week. I saw someone’s note about not putting the salted caramel into the cheesecake; I think that might be incorrect. I added it and the cake was delicious. Should the cream cheese be room temperature? It might be helpful to add that to the recipe itself in the ingredients. Mine was cold and a chunk was left behind when I poured the batter. Otherwise, super easy to follow and delicious. Baked this cheesecake this week. I saw someone’s note about not putting the salted caramel into the cheesecake; I think that might be incorrect. I added it and the cake was delicious. Super easy to follow and delicious. 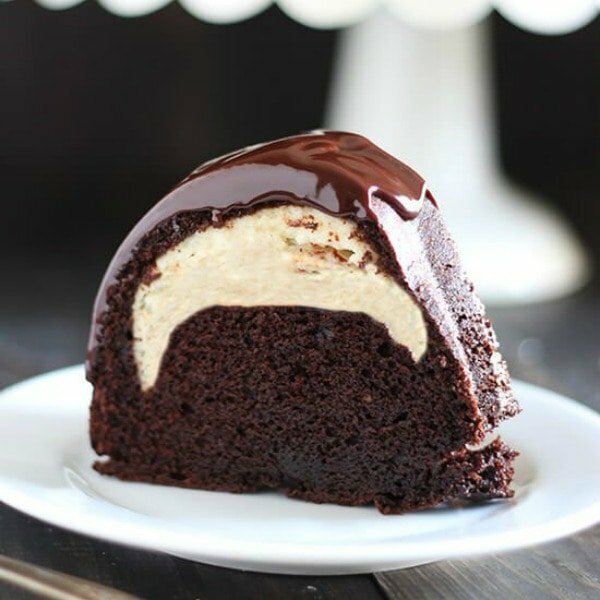 How would the cooking time differ if I made this in a cupcake pan instead?? ?